High Quality Content by WIKIPEDIA articles! Petrus Alphonsi (also known as Peter Alfonsi; born Moses Sephardi) was a Jewish Spanish writer and astronomer, and polemicist, who converted to Christianity. Born at an unknown date in the 11th century and an unknown place within Muslim Spain, he embraced Christianity and was baptized at Huesca on St. Peter's Day, June 29, 1106. In honor of the saint and of his royal patron and godfather he took the name of Petrus Alfonsi (Alfonso's Peter). 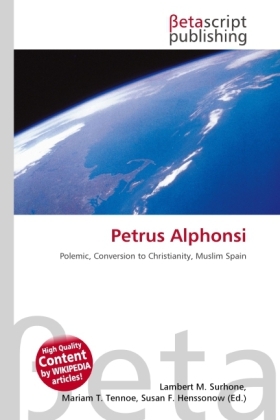 Petrus was born a Jew while living in al-Andalus, and after he rose to prominence, he converted to Christianity. This environment gave him an advantageous knowledge of Christianity, Judaism and Islam that would later prove useful in his polemics. John Tolan mentioned in his book Petrus Alfonsi and His Medieval Readers that "Alfonsi's texts were received enthusiastically he became an auctor, an authority to be quoted. His success was due in large part to his ability to bridge several cultures: a Jew from the [Muslim] world of al-Andalus."